A reduction is a high, shallow incursion into the opponent's framework or sphere of influence. 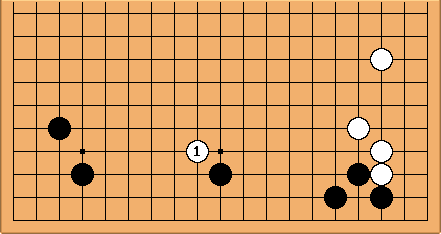 In contrast with a deeper invasion, the idea is gently to reduce the size of the opponent's framework, limiting it to a manageable number of points, by playing near the edge of it. In that sense it is less ambitious than an outright invasion, which may involve playing right in the heart of the framework in the search for eye space. However reduction is often less risky than an invasion, allowing the reducing group to run away in good order; and it can be just as effective. The correct point for a reduction is often in the center of the imaginary line on the top edge of the framework (a sector line). The opponent will either protect from the inside direction, in which case the reduction has succeeded, or attack from the outside with a move such as a cap, in which case a jump further into the framework from the initial reducing stone will create the beginnings of a living shape.